Products are cool. Some are fun. We in this business of qualitative research are curious about products, and that’s why we spend time studying, exploring, thinking about, and using them. we come across an especially fun, cool product, and not all of them come fresh off the shelf of your local Target (though, admittedly, many of them do). Sometimes, these cool, fun, curious products are discovered hidden on a shelf of the house you grew up in, or in the back of your aunt’s attic, or in a forgotten corner of a closet where you’ve been storing stuff you didn’t want to throw away but also never use anymore. As I come across such items, I’ll post them here, in a new series called Really Neat Things, and its subset Really Neat Things That Solve Problems. This one is a long unused lap desk (lap desks themselves being already inherently great inventions) with a crossword puzzle theme. 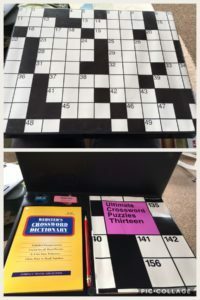 On this one, the desktop opens up, and inside it is equipped with a book of crossword puzzles, a crossword puzzle dictionary, a pencil sharpener, an eraser, and a slot for a pencil. Here, from the annals of Solomon Solutions’ new series “Really Neat Things” is Installment #1. Oooo how can I get one?